Eleven Arts Anime Studio is having a strong year so far, bringing films such as Maquia: When The Promised Flower Blooms and Harika-San to eager US audiences. 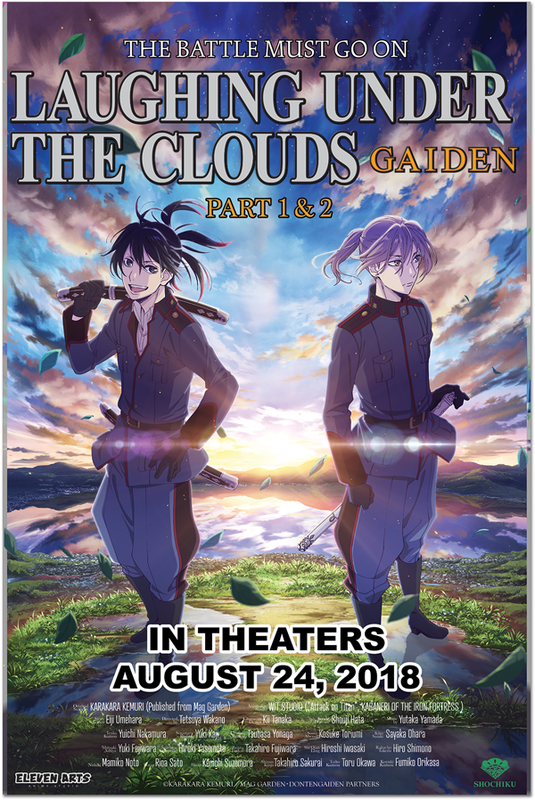 They have now announced that they will also be bringing the multi-part Laughing Under the Clouds: Gaiden to cinemas. Parts One and Two will be released in summer 2018, with the third and final part scheduled for next year. Now that the Yamainu have vanquished their enemy and escorted all criminals to the local prison, government officials decide to outlaw swords - putting Japan’s great avengers out of a job. So now the Yamainu, all trained assassins, must pull together to find a new cause, one within their own group. The films are produced by the acclaimed WIT Studio, the people behind Attack On Titan and Kabeneri Of The Iron Fortress. Gaiden promises to offer plenty of the kind of action and drama that WIT are known for. However, "what is remarkable about this story, and especially universal in appeal," says Eleven Arts "is its attitudes toward grief, sensitivity, depression, violence, and compassion. The film perfectly balances the physical with the emotional and updates the Meiji Restoration with a contemporary feel, ensuring that there’s something in it for everyone." The first two parts (running 50 minutes and 60 minutes, respectively) are screening together from August 24, 2018. All screenings will be in original Japanese language with subtitles. The initial list of screening venues can be found, below. Please note dates are subsequent to change and additional dates may be added. Please see the Eleven Arts website for updates or to book your tickets.